After a hearty steak dinner at Jack's Place, belly up to the bar at the Town Tavern for a cold pint of your favorite brew. With the wheel and anchor motif, is this place frequented by many sailors? Unlikely. Dansville is hundreds of miles from the ocean. 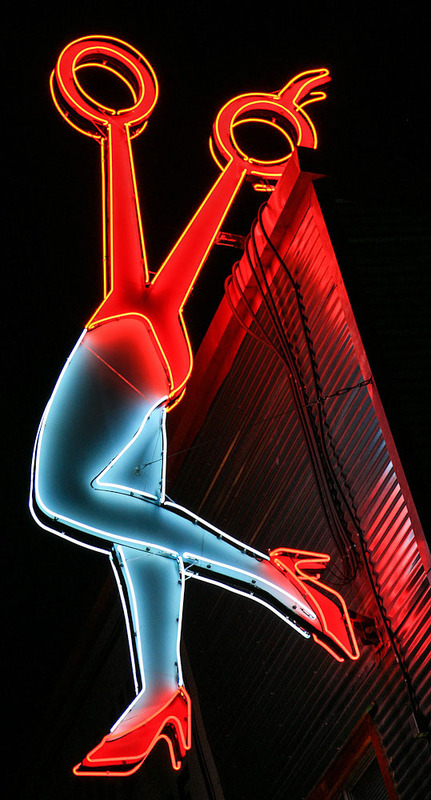 Here is one of Pittsburgh PA's greatest neon signs. 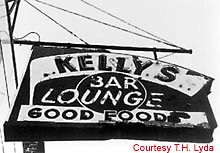 Kelly's Bar is a deco cocktail lounge circa the 30s or 40s and is in the process of being restored, including the neon. "Under the neon palms" was an expression heard for many years until this fall. 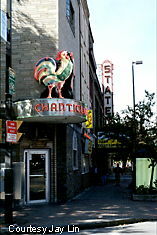 Famous for the appearance of the Rolling Stones in 1977, this Toronto landmark closed it's doors for the last time. Hopefully the El Mocambo Tavern sign will be rescued by an appreciative benefactor. Again we go to Johnson City NY where we find the Belmar, a very working-class bar where you can get a cold beer after a tough shift at the factory. If you are ever in the Fort Monmouth area of Eatontown, New Jersey and need a quick snack or bagged ice for your cooler, Triple S Bar and Liquors is the place. A large, eye-catcher of a sign in the New Jersey area. Ithaca, New York is the home of Cornell University and multi-colored roosters. The Chanticleer Lounge is a stop-off on the way to the theatre. Here's a small bar sign from a tiny place in upstate New York where you can drink away the small town blues. Check out the marquee on Al's Lounge as it just over the entranceway.